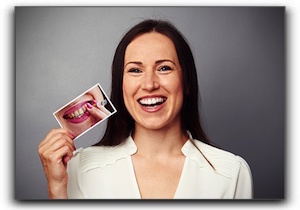 Home › Cosmetic Dentist › Full Mouth Reconstruction in Seattle: Is Your Smile In A World Of Hurt? Do you have extreme tooth damage, bone loss, or few or no teeth still intact? This post is for Seattle area residents whose mouths are in a world of hurt. First off, we feel for you. We understand how severe dental issues affect you every day of your life. Whatever the cause of the condition, believe us when we say that there is hope. Full mouth reconstruction in Seattle can restore your previously healthy, beautiful smile or give you the dazzling smile you never had. Patients who undergo full mouth reconstruction in Seattle regain their confidence to smile, eat, and speak normally. How would that impact your life? Replacing missing teeth and adding bone through grafting restores the underlying facial structure, improving or preventing that “sunk-in” look that ensues when teeth are gone and the jawbone recedes. A full mouth reconstruction in Seattle refers to a combination of dental procedures that restore a smile for people with multiple damaged or missing teeth. Treatment may include any combination of the following procedures: crowns, inlays/onlays, dental bonding, white filling replacement, tooth implants, porcelain veneers, implant-anchored dentures, gum contouring, soft tissue grafts, bone grafts, and tooth whitening. Dental implants are usually the best tooth replacement for patients with missing teeth. A dental implant consists of a titanium post surgically inserted into the jaw bone to replace the root of the missing tooth. If there is not enough bone to anchor an implant, bone grafting may be completed to augment existing bone. The post integrates with the bone to provide a sturdy foundation for the abutment and beautiful crown. Dental implants are indistinguishable from previous teeth in both form and function. If you currently have dentures, speak with us about implant-anchored full or partial dentures. Significant improvements can be made even if you only get two or three tooth implants. Advanced Cosmetic & Laser Dentistry offers a full menu of cosmetic dental procedures including total mouth reconstruction. Cosmetic dentistry may be more reasonably priced than you think. Talk to us about financing or a multi-procedure treatment schedule that allows you to pay as you go. Restoring a healthy smile may be the best investment you ever make. Use the form below to ask a question about Full Mouth Reconstruction in Seattle: Is Your Smile In A World Of Hurt? and one of our expert team members will get back to you shortly.